Bid management may seem easy at first glance: you set the price for a click and sit back watching money rolling in. However, given the impact click bids have on the advertising cost and effectiveness of your campaign, many begin to understand that smart bids management is one of the trickiest things in PPC advertising. So those, who will learn how to manage bids correctly, will be able to improve efficiency of their advertising campaigns and win the game. 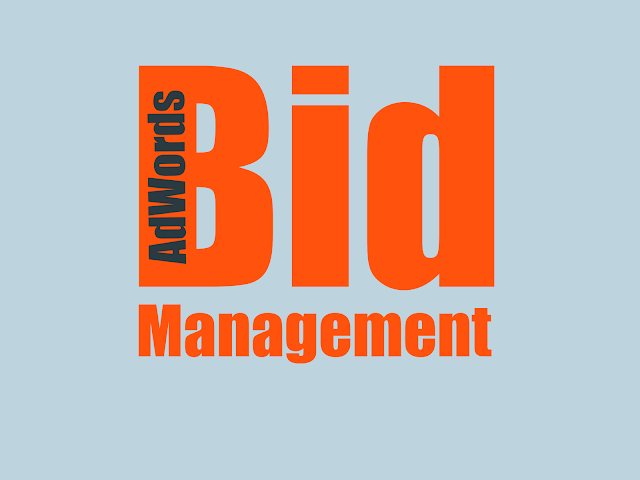 The necessary condition for the correct bid management is conversion tracking set up in AdWords. To get the most efficiency, paste a Google Analytics tag on each page and set up goals for each desired action: purchase, lead, registration or everything else. The next step is to import these conversions from Analytics or install a separate conversion tracking code from AdWords. Either way, these measures will allow you to see the effectiveness of each campaign, ad group or keyword. PPC experts know that bids for keywords allow you to control your site position in SERP. However, you will not achieve results you want by increasing or decreasing maximum cost per bid only. Bids pared with quality score is what determines the place of your ad in the search results. Therefore, an equally important factor for an effective bids strategy is monitoring the keywords quality score. Expected CTR of an Ad: historical CTR compared with competitor’s ads CTR influence this parameter. for? From our experience, using automatically inserted keywords in the ad title leads to more clicks because of higher relevance of the ad. Landing Page Quality: if the keyword you promote is absent on the landing page, it will affect the quality score in a negative way. Page loading speed, unique content and user-experience are crucial and influence this parameter as well. This is why you should consider landing pages carefully. The higher your Quality Score is (10/10 at the best), the lower the bid you need to win the auction. If you have just launched an advertising campaign, do not rush immediately to adjust bids. We recommend that you wait for at least 1-2 weeks to collect sufficient amount of clicks and conversions. When you have at least 200-500 clicks and some conversions, you have the data in your hands to make decision as to what keywords we can bid higher and which are not worthy that. The main idea of bid management is to reduce rates on ineffective words and to increase rates on the keywords that bring cheaper conversions. It’s very important to provide changes strictly on the keyword level, not on ad group level. Of course, it is easier to change the rates on ad group level — it's easier and faster. However, this method is not advisable. For example, one ad group has 10 keywords. Five of them are working perfectly and bring conversions with low acquisition cost, while other five perform very poorly. When you look at the ad group, you may decide that the whole ad group does not work effectively and turn it off completely, although you could reduce traffic for ineffective keywords only. An important note: we do not recommend turning off the keywords, because all keywords are useful if they are selected in accordance with the topic of your business. Even if they do not bring direct sales, they may have a significant contribution to the branding and associated conversions. So before you start adjusting the bids, you should divide the keywords into 4 segments, which then you will edit differently. Start analyzing keywords with conversions, first. If the cost per conversion is less than we want, we increase the bid on this keyword. The adjustment will enable us to improve the position of an ad and attract more traffic. If the cost per conversion was higher than planned, we should lower the bid to reduce the number of inefficient traffic. In our example, desired cost per conversion is $60. That’s why we will increase bids for keywords [hair extensions] and [hair extensions online]. But we are going to lower bids for keywords +clip +in +hair +extension, because this one brings very expensive conversion. The word "clip in hair extensions" belongs to the 2nd segment. We spent on this word $84, but haven’t received any conversion. So we will reduce bids for this one and other words from the second group. The 3rd segment contains keywords that were shown on lower positions (3.5 and below) and didn’t bring any conversions. People don’t spot ads so much located down the list and therefore click on them quite rarely. So we raise the bids on these words in order to improve the average position and get the desired number of clicks. In the fourth group we have keywords that don’t have impressions. We can raise bids for such keyword to exclude the situation when the keywords are not shown because of the low bids. When we manage bids manually, we can raise or lower bid depending on how much the real cost of conversion differs from the desirable price. Typically, this is 10-50%. 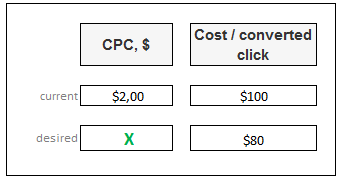 According to this proportion we should reduce cost per click from $2 to $1.5. Although such calculation is quite straightforward and isn’t always necessary for every word. If to being advertised for a particular keyword cost us $110, but did not bring any conversion (with the desired cost per conversion of $100), then we will reduce the bid slightly, by 10-15%. The main advantages of the manual method are full control of the situation, the ability to cancel any edits. However, this method is time-consuming to analyze and implement edits. So this method is not recommended for huge accounts. To provide automatic edits, we have to set up certain rules for the each of our keyword segments. The system of Google AdWords will change the bids according to specified conditions and time intervals. 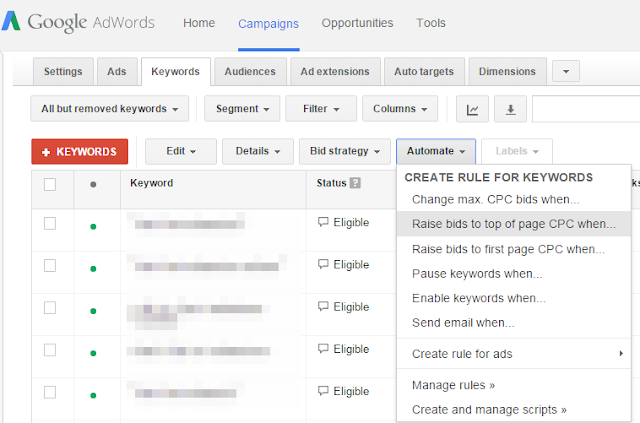 To create a new rule, you need to select “Automate” on a campaign, ad group or keyword level and choose the right option from the list. The only problem is to make sure that your rules work properly. Check out how to create automated rules for certain segments. Goal #1: To increase bids if there is no conversions and low average position. Please note that this rule only applies to a certain search advertising campaign. With Google Display Network or brand name campaigns this rule can be not so effective. The same rule we can create for ads without conversions. In this example we added the rule that the average position should be less than 1.5. If the keyword has higher position, this rule will not be so much effective. Goal #3: To increase bids for the keywords without impressions. This rule will increase bids by 15% for all the words that had no impressions during the analyzed period. In this case we put a cap on the maximum bid. So we raise the bids until the keyword does not begin generating traffic. After this it will automatically be placed under another rule. What are your PPC management smart tips? Share your experience with us in the comments! Irina Nikulina is a PPC Specialist at Promodo. She has Marketing Master's Degree and over 3 years of experience in search engine marketing. Irina has managed advertising campaigns for large IT companies, and now she specializes in ecommerce PPC. Irina is continuously testing new tools and features and always ready to share her knowledge with others.